Collaborative robots are proving to be an important competitive differentiator that assists factories around the globe become more agile and responsive to evolving market demand. Manufacturers want to become more flexible and adaptable than ever before to remain competitive. Labor shortages, rising wages and an increase in the demand for personalized products present challenges to productivity and efficiency. To combat such issues, many manufacturers are turning to flexible automation. Traditionally, customization was seen as an obstacle to automation. For instance, a custom parts manufacturer for outdoor power equipment and automotive industries involves thousands of custom parts being produced thus humans perform mundane, repetitive tasks. From the packaging of custom parts into boxes for shipping to cleaning the parts before the final packing, workers were used to engaging in projects that did not require them to use any cognition or reasoning. Furthermore, there are also a dozen other jobs and tasks in many factories that desperately need people. The game changing modern robots known as the collaborative robot or cobot from Universal Robots is changing the game when it comes to customization. The robots are specifically designed to perform in variable, real-world manufacturing environments typical of customized product lines. Because of its advanced robot positioning system (RPS), cobots can easily adjust to parts that are bumped slightly out of place, without having to stop and reprogram. The robot is so easy to train that any factory worker can easily conduct the training without any prior programming experience. At Standby Screw Manufacturer for example, Cobots works in tandem with the traditional caged industrial robot to clean and package worm shafts which are the long, cylindrical gears used in self-propelled and walk behind lawnmowers. 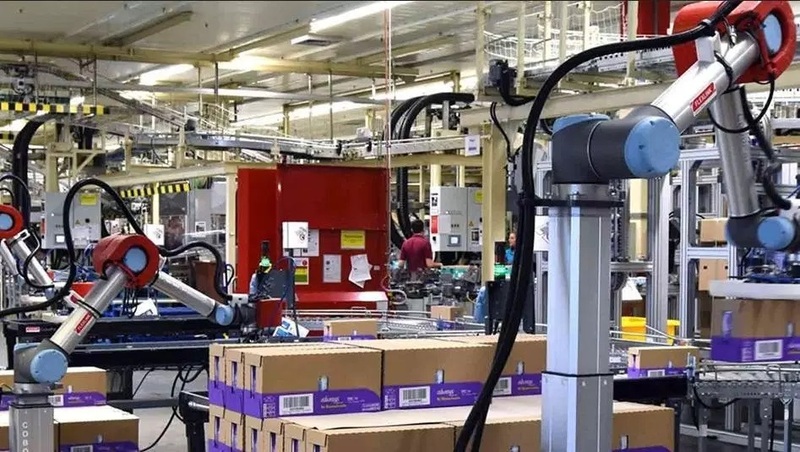 The traditional industrial robot feeds the parts to the cobot which then uses both arms to move the parts into a slot and later clean the machine oil off the part before placing it into one of two boxes. Meanwhile, there is another collaborative robot that tends their milling machine by picking pivot rods designed for snow blowers out of a feeding unit and placing them into a machine that cuts flat ends on the rod. In these two scenarios, the combination of collaborative and industrial robot creates an efficient, automated process thereby allowing human workers to focus on tasks that require a greater cognitive skill. Collaborative robot works directly at the workplace alongside employees, making it a true collaborative relationship. As a result of the unique force-sensing technology, cobots are completely safe in this situation. Apart from its ability to collaborate with humans, the cobots can also be used overnight whenever they are needed to increase output. With this added production time factored in, the cobots assist companies achieve a high-volume output which in turn gives them the freedom to maintain a competitive price point of their products and compete with other manufacturers around the globe. The increasing incidence of design and product change in manufacturing means that some automation applications can never achieve complete payback from one product alone. However, by automating tasks with the robots, employees are allowed to take on more complex roles throughout the factory thus saving such company’s resources and enabling them to stay nimble and increase the consistency of manufacturing operations to compete better on the global stage. Trends toward mass customization and faster product cycles continue to favor cobots, and these trends are perhaps the main reason why more of them will be coming. Manufacturing is very complex, but with the many variables present in today’s marketplace, it is more imperative that industries will continue to seek the most flexible and cost-effective solutions which enable automation in a wide variety of applications. Collaborative robot is one piece of the solution which is already bringing results to forward-thinking manufacturers; we can expect this trend to continue gaining momentum for years to come.